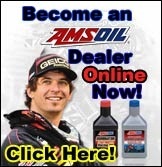 Synthetic Distribution LLC is a authorized Amsoil Synthetic Motor Oil dealer. Top Quality synthetic Amsoil products, in stock or you can order in as little as 2 days wholesale, NOT RETAIL. 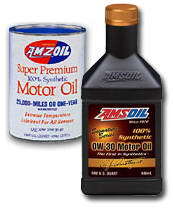 Compare Amsoil to Mobil 1 One Shell Havoline Castrol Pennzoil or Valvoline. Amsoil Diesel Oil, Wholesale discount prices to local customers. Saber 2 cycle oil packets, Interceptor snowmobile. We have a documented history of innovation and leadership. In 1972, AMSOIL introduced the first American Petroleum Institute rated 100% synthetic motor oil for automotive applications. AMSOIL was the first to introduce a concept of "extended drain intervals" with a recommended 25,000-mile 12-month drain interval. AMSOIL lubricant technology has been field tested over the last 35 years in the most severe driving conditions. Including family fleets, over the road big rigs, towing, hauling, motorcycles and of course racing. In addition to being reformulated to meet the latest API SN Resource Conserving and ILSAC GF-5 industry specifications, the new Signature Series line features all-new packaging and represents the very best motor oils AMSOIL has to offer, allowing motorists to take advantage of maximum extended drain intervals. In the interest of consistency and clarity within the Signature Series line, all four motor oils are recommended for drain intervals of up to 25,000 miles/one year, whichever comes first (15,000 miles/one year in severe service conditions). Click to see 25 k mile oil page. AMSOIL XL Extended Life Synthetic Motor Oils provide better wear control, high- and low-temperature protection and increased fuel economy compared to conventional oils. Formulated with extended-drain boost technology, AMSOIL XL Synthetic Motor Oils provide superior performance for up to 10,000-miles/six months, or longer when recommended in owner’s manuals or indicated by electronic oil life monitoring systems. Click here to See all the 10k mile oils. AMSOIL Synthetic Motor Oils dramatically outperform conventional petroleum motor oils. Synthetic lubricants are engineered, synthesized lubricants consisting of 100% PAO Formulated Basestock Technology, and maybe made to fulfill virtually every lubricating need. The molecular uniformity of synthetic lubricants promote superior lubrication and friction reduction, which in turn promotes superior heat control, wear control and energy efficiency. Molecular uniformity also helps synthetics maintain their protective viscosity in high-temperature operations, which also promotes superior wear control. Because they are derived from pure chemicals, synthetic lubricants contain no contaminants or molecules that “don’t pull their own weight”. Synthetic Lubricants contain no paraffin or wax molecules like conventional lubricants. Why AMSOIL Synthetic Motor Oils? They reduce friction, heat and wear for maximum power, performance and fuel efficiency. Resistant to high temperature burn off, chemical breakdown and "sludging" keeping engines cleaner. Provides low temperature fluidity for fast, dependable winter starts and cold start protection. Exceed the most demanding world-wide performance standards and meet warranty requirements for all domestic and imported passenger car engines, both turbo-charged and non-turbo-charged. AMSOIL Signature Series provides up to 25,000-mile or 1-year drain intervals. The AMSOIL extensive product line includes the finest quality Engine, Diesel Oils, Gear Lubes, Greases, Industrial Lubricants, Extreme Condition Lubricant and Filtration Products. NOTE: TO UTILIZE THE FREE SHIPPING, PICK A CATEGORY BELOW AND FOLLOW THESE STEPS. WHEN THE NEW WEB WINDOW APPEARS, CLICK ON THE TAB THAT SAYS "CONTINUE SHOPPING". YOU WILL BE TAKEN TO THE ONLINE STORE TO MAKE YOUR PURCHASE OR GET MORE DETAILS ON THE PRODUCT'S.